I often find that I can't always see the material I'm trying to tweak in my viewport. Several materials that are particularly difficult to see clearly in the viewport are Vray's LightMaterial and Refractive Materials. If my VrayLightMaterial is controlled by a texture map, it becomes really hard to tweak the UV's in the viewport because the map is displayed as white. For refractive objects, (when using v-ray), if they are 100% refractive, then they disappear completey from the viewport, and are really hard to locate in your viewport shaded mode. Sure you can turn on "Edged Faces", but this doesn't still solve the issue of glass panes that have 6 faces, as they are very hard to see in wire frame. To make my life a little easier, and keep me from steering blind in the viewport, a trick I do is to use the Shell material for the above examples. For the VrayLightMaterial, Place an instance of your VrayLightMaterial into the Original Material slot of the Shell Material. Then under the Baked Material slot, you can put another material in there that has an instance of your texture map that's driving the VrayLight Material. It can be a Standard, A&D, or Vray Material...it doesn't matter because it's just for the viewport. For the glass material, I basically do the same thing, but on the standard material, I can tweak the opacity and color to represent something similar to the renderable material. Now the viewport makes much more sense, and easier to work and edit. I can actually see the glass, and even represents the right color. 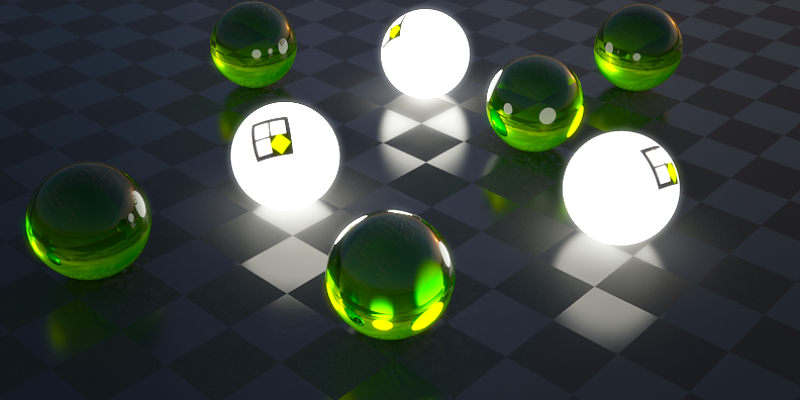 Now I can also see the texture map on my light balls and edit the UV's as I please. Awesome idea for the glass! I always end up turning viewport display transparency on and off a lot. But for the light material I usually just set it to pure black as the map is what will be controlling the color now anyway and will be 100% viewable in the viewport once that is set. Havent had any issues doing that at least on my end. Never tried that, but you're right! That works too...thanks for sharing! Ummm, this is awesome. I never thought about doing it that way. Thanks fellas. About that VrayLightMaterial texture, that texture is still not visible in the viewport. But if I change the diffuse color, it shows in the viewport. Great Tip!, also useful for liquids & metals, I've been wanting a fix for this literally for years.